New partnership means big savings for you on online training! 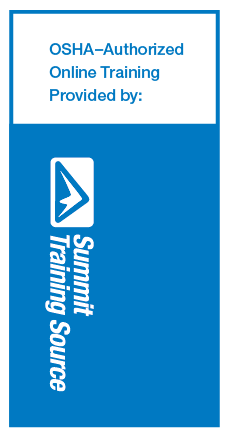 Minnesota Safety Council has once again teamed with National Safety Council and Summit Training Source to provide members with huge discounts on over 100 online training modules, including OSHA 10- and 30-hour and HAZWOPER programs! Over 100 courses to choose from, including yearly compliance training for bloodborne pathogens, hazard communication, lifting and lockout/tagout. Register for online training and purchase seats. Learn more about OSHA 10- and 30-hour and HAZWOPER training options. Questions? Contact Steve at 651-228-7326 or steve.rauh@minnesotasafetycouncil.org.